Fish eggs in your water? No, you haven’t struck a gold mine of caviar. We are called more often than you’d think with the strange and mysterious detection of fish eggs coming out of the shower. The first thing clients often think is that the city water supply has somehow been contaminated, those little orange balls are actually from your salt water softening system. You can’t always predict when your salt water softener is going to blow it’s lid – so to speak. It isn’t the lid that breaks but rather the screens at the bottom that stop the medium from getting inside your water line. If that screen breaks the medium that is used to filter minerals from your water does quite the opposite, it allows the medium directly into your water line. If you turn on a fixture in your home and notice things aren’t quite right, your fist impulse may be to turn on all of your fixtures and attempt flushing the medium out of your water line…..DON’T. The second that you notice this material, or any foreign material in your water line the first step is to stop! Stop using your water. The more fixtures you use the further you will spread the contaminant. Just like when you’re sick you don’t want to touch anything so you don’t spread the illness, it is the same for your plumbing system. You cannot simply flush this debris from your water lines by turning your fixtures on. The debris is too large to pass through your faucets, shower valves and toilets and will only clog up the components. If you’re one of the unfortunate ones who are reading this article too late and you have already turned on the water to find this medium in your plumbing system, it is time to call a qualified professional. 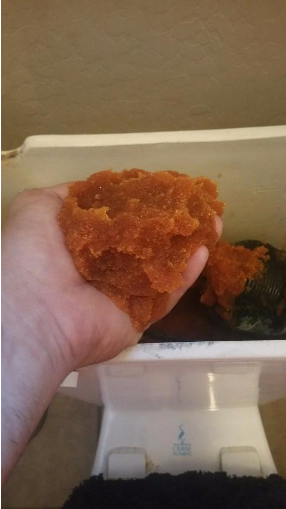 This medium is in your water heater, and in the rest of the plumbing as well. Once this medium reaches your fixtures it is more often than not that the insides of each fixture will have to be replaced. The plumbing team at Robins Plumbing know how to properly flush your system of the contaminates and how to prevent as much damage as possible to your plumbing fixtures increasing the likelihood that the plumbing fixtures can be flushed or repaired rather than replaced.